Since our founding, Team Colorado has helped organize athletes from around the state at the Gay Games, a quadrennial sporting and culture event bringing athletes from around the world together. At the most recent games in Cleveland in 2014, Colorado proudly sent teams to compete in swimming, martial arts, volleyball, bowling, tennis, track and field, triathlon, and the half marathon, among many others. 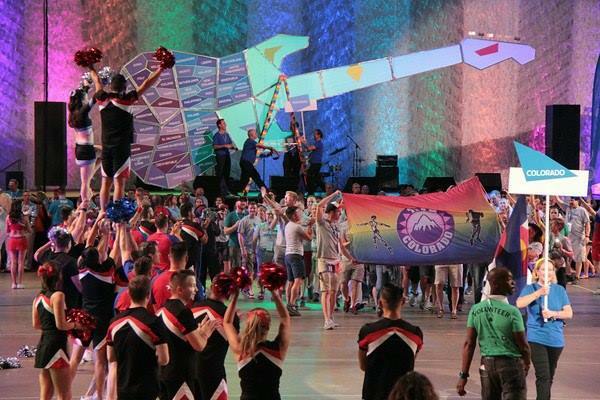 While many gold medals returned to the Centennial State, the close friendships and wonderful memories formed with LGBTQ people and our allies from across the world are at the center of the Gay Games experience. Team Colorado is proud to offer scholarships to participants in the 2018 Gay Games X in Paris, France. These Ambassadors will represent the best of Colorado at the Gay Games, and will return afterward to help promote inclusion within sport in their local communities. Selected Ambassadors will receive up to $1000 to help cover some of their travel and competition expenses for the Paris 2018 Gay Games. We ask that all Ambassadors attend Team Colorado events in Paris, and continue to play an active role in the community after they return. Applications will be evaluated based on these three goals. The initial deadline to apply was March 15th, but we will continue to evaluate applications on a rolling basis, with preference given to those who applied before the deadline. Applications must be submitted electronically through the above webform. This application is open to all residents of Colorado. Ambassadors must be able to travel to France. US citizens likely require a valid US passport expiring after February 2019 (due to limitations on entering a foreign country within 6 months of the passport’s expiration), and non-US citizens may require a visa for entry (see: French Ministry of Foreign Affairs). Help send Coloradoans to Paris! If you are interested in supporting the 2018 Colorado Ambassadors Program Fund by making a tax-deductible donation, please use the “Donate” button below, or get in touch with us at fundraising@teamcolorado.org.